Steeped in history and brimming with religious tradition, Asia’s cultural heritage spans as far and wide as its geography. From Buddhism to Hinduism, Taoism and beyond, Asia's steep religious traditions vary drastically from country to country, and in some cases, region to region (here’s lookin’ at you, China; the only country in Asia that covers 5 time zones!). 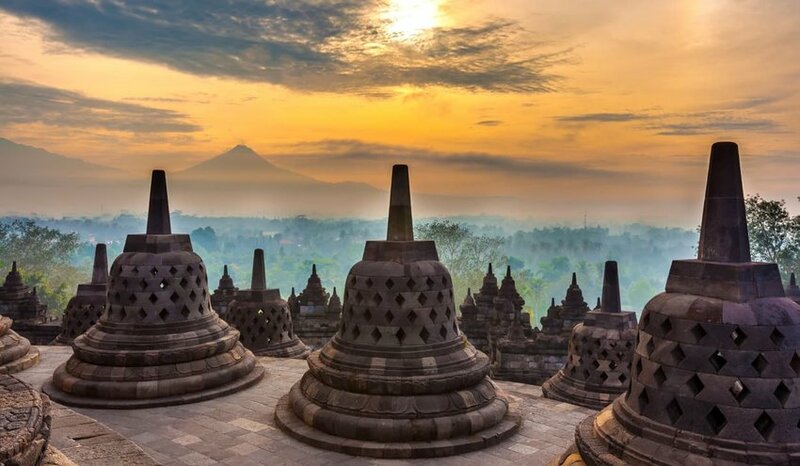 Embarking on an Asia-wide temple trail will bring you from the lofty Buddhist monasteries of the East to the elaborate Hindu Temples of the Southwest, exploring both timeworn edifices and contemporary architecture. Packed with soaring pagodas, ancient stonework, and plenty of teetering staircases, here’s our selection of the top 10 most beautiful temples in Asia. 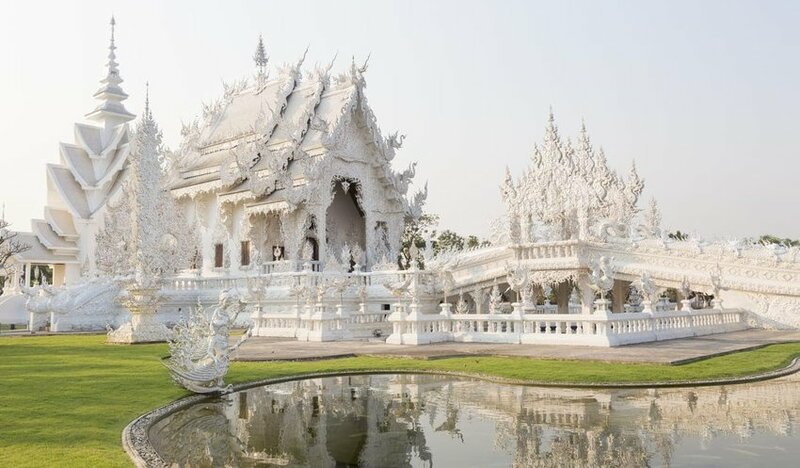 One of the most famous (and least conventional) temples on our list, Wat Rong Khun is a privately owned temple/art gallery located in Northern Thailand’s Chiang Rai Province. It underwent huge renovations in the 1990’s and has since become a center for Buddhist learning and meditation - as well as one of Thailand’s most popular tourist attractions. With white, icing-like details reflected in a still lake, it's not hard to see why this temple stands out above the rest of Thailand's 33,000+ Buddhist temples. 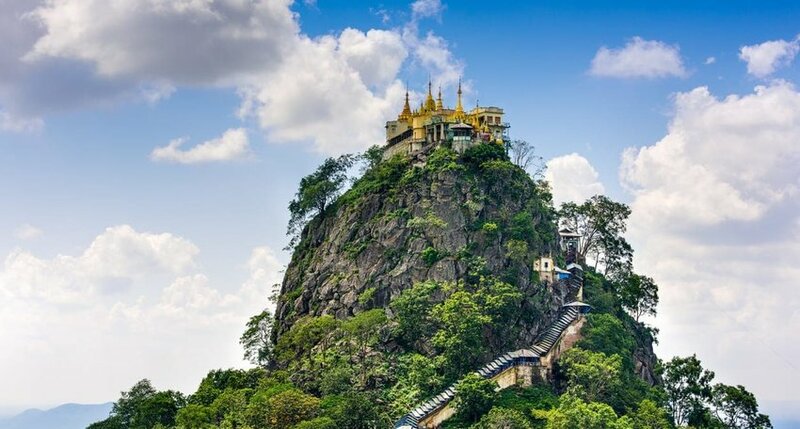 Located in Mandalay, Mount Popa is a volcanic peak that sits more than 1,500 meters above sea-level. On the southwestern slope, Taung Kalat is a ‘lava neck’ with sheer cliff-like sides, on top of which you’ll find the dramatically-placed monastery. Not for the faint of heart, this temple requires visitors to scale the 700-odd steps to the top. But the view from above? Totally worth it. Not to mention the gold detailing and statues representing Burmese spirits that populate the monastery. Just watch out for macaque monkeys - these little thieves will steal anything loose while you're taking in the view. Just 60 kilometers away from Mandalay, Bagan is easily one of the best places in Asia to go temple-visiting. With more than 2,000 temples spread across the lush green countryside, you could spend a lifetime in Bagan and still have spots left to explore. 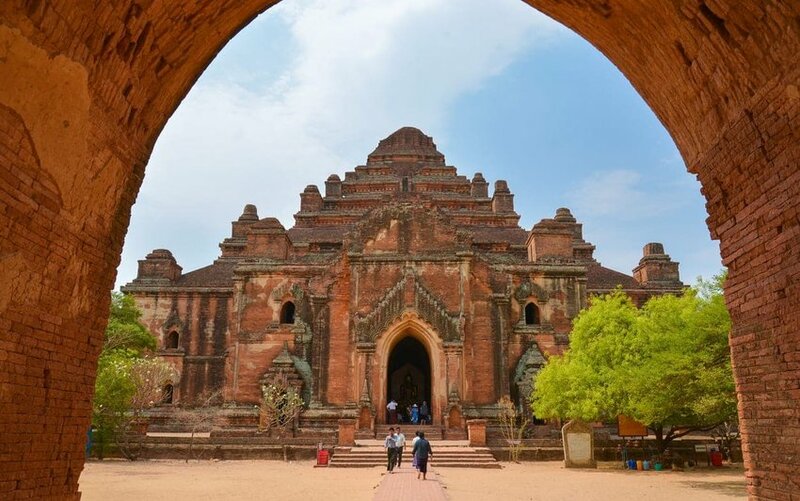 Old Bagan is filled with incredibly beautiful holy sites (Andaman Temple is another one of our favorites), but we think the cream of the crop is Dhammayangyi Temple with its ornate mortar-work and tiered rooftop. Not only is it the largest in the region, it's also one of the most intact, and offers a great vantage point for watching hot air balloons rising into a sunset-lit sky. 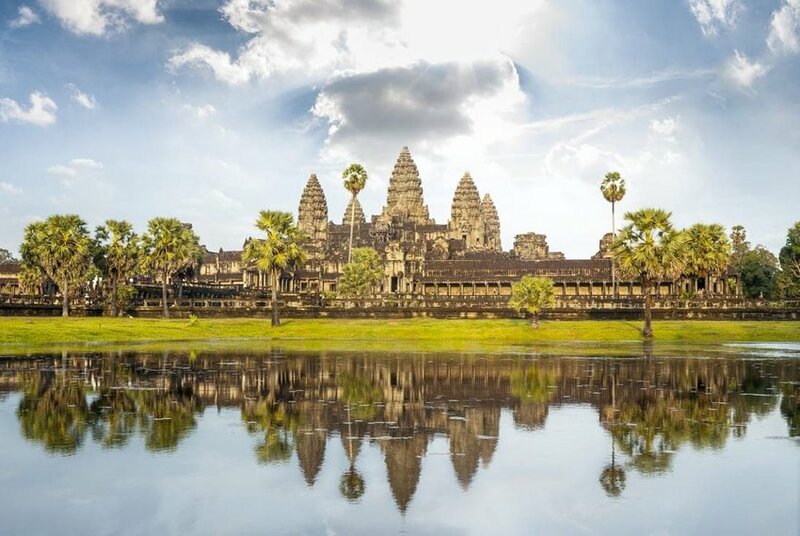 Prestigiously listed as one of the 7 Wonders of the World and a UNESCO World Heritage Site, Angkor Wat has long topped the bucket-lists of adventurous backpackers and culturally minded tourists -- and for good reason. Apart from being the single largest religious structure in the entire world, the complex is even more unusual thanks to its unique mix of Hindu and Buddhist roots. Today it's Cambodia's top tourist attraction, drawing thousands of visitors each year. Colloquially known as the Tiger’s Nest, the Paro Taktsang Monastery is perched on the edge of a cliffside overlooking the stunning Paro Valley. Considered one of the most beautiful examples of a Himalayan Buddhist temple, the monastery is comprised of four separate structures. It's the crowning jewel for this isolated nation, drawing hikers and adventurers with its unique placement and gorgeous views. Definitely one of the most underrated spots on this list, this Buddhist temple should not be ignored. Located in Central Java, this 9th-century Mahayana Buddhist temple is one of the oldest on our list. Now recognized as a UNESCO World Heritage Site, this temple towers above the surrounding greenery, giving visitors a fantastic display. The temple features nine towering tiers and is intensely decorated with serene Buddha statues and perforated stupas, creating a dizzing symmetrical effect. It's one of the largest Buddhist temples in the world, and certainly one of the most recognizable. Kyoto, the ancient capital of Japan, is a city famed for its imperial palaces, lavish gardens, and fascinating religious sites. The entire city is teeming with temples worth visiting - but if we had to narrow it down to our absolute favourite, Daigo-ji easily tops the list. 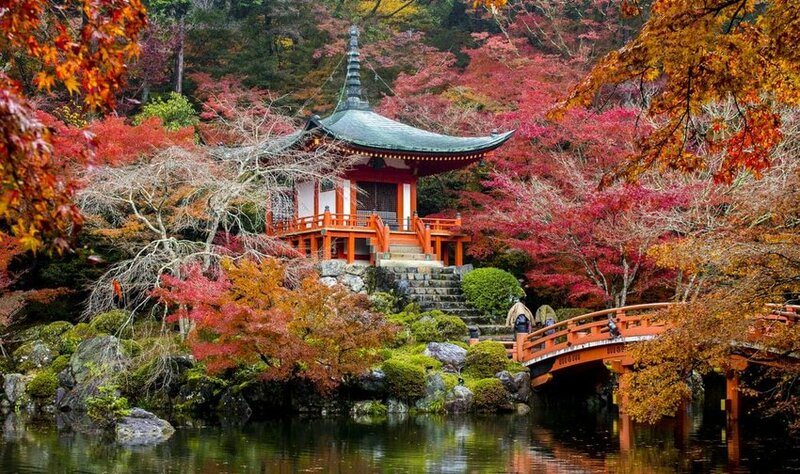 Elegant bridges cross over tranquil streams leading to a pagoda half-hidden by flowering trees. It's a serene location for a Buddhist temple, and the complex has been around since 1115. For the most stunning visuals, visit during sakura (cherry blossom) season or autumn when the maple leaves turn crimson red. 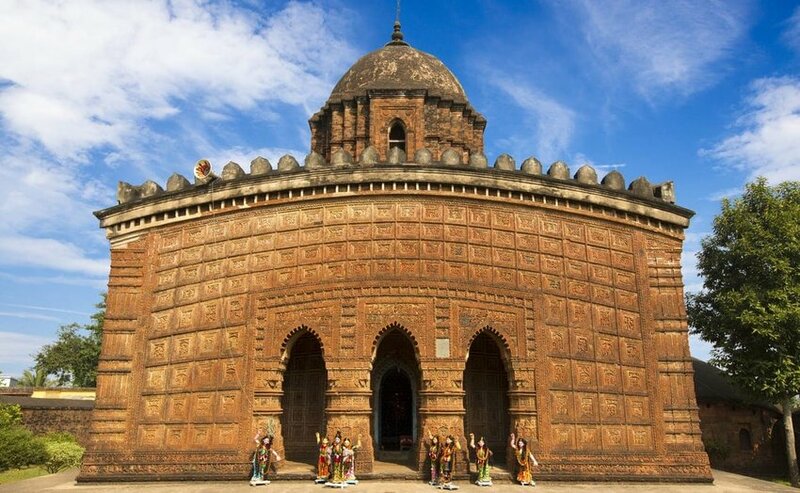 The town of Bishnupur in West Bengal is famous for its many Bengali temples, most of which were constructed from terracotta by the Malla kings. Steeped in folklore, the individual histories behind the temples is as intriguing as the buildings themselves. Many temples fly under the radar, with only a few attracting tourist attention. But the intent traveler can explore the hidden ruins of these intricately carved temples with the help of a local, which we highly recommend. 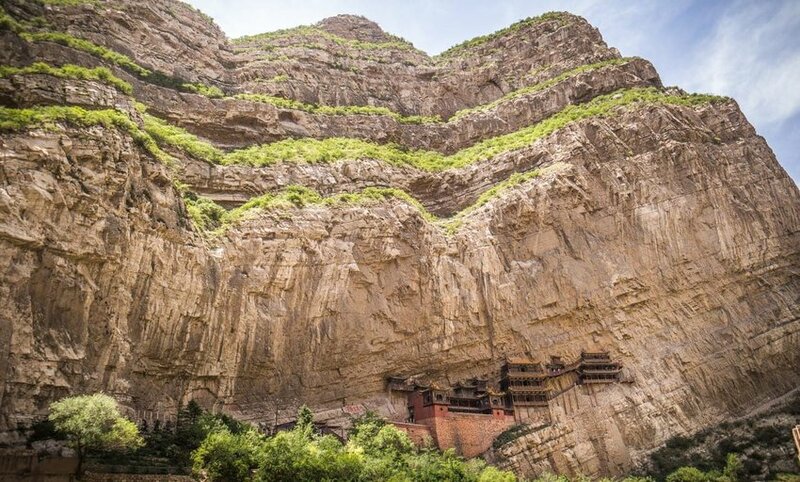 Set into the cliffside 75 meters above the ground, The Hanging Temple (or Xuánkōng Sì, as it's locally known) is one of the most dramatic in the country. With a 25-story drop below, and the tenuous stairs leading to the main building, getting here is not for the faint of heart. But beyond its terrifying placement, the Hanging Temple fascinates as one of the only known temples that combines practice and prayer from Taoism, Buddhism, and Confucianism. Perched high on a plateau in the heart of Tibet's capital, Jokhang Temple is the main symbolic center of spirituality in Lhasa and one of the most sacred spaces in all of Tibet. It’s located just 1 kilometer away from the Potala Palace (the former Dalai Lama’s residence) and now falls under the same UNESCO protection as the palace itself. 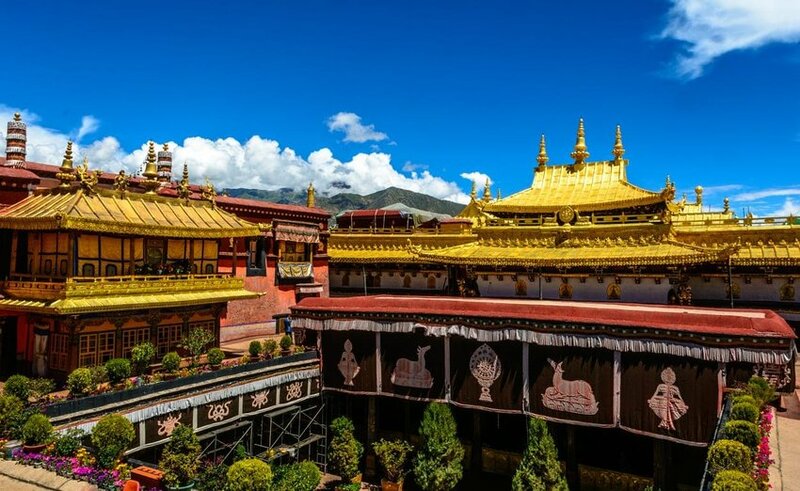 Tragically, Jokhang Temple was badly damaged in a controversial fire incident in February 2018, but repairs are already well underway to restore this temple's beauty.